Tails up! 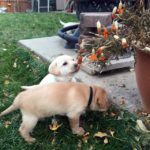 Fast growing yellow lab puppies! 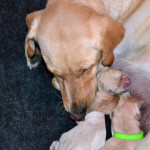 Time flies — puppies now three weeks old! 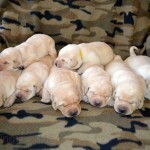 Yellow lab puppies now one week old! 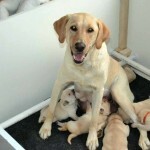 Inara had eight yellow lab puppies yesterday! Four males, four females. 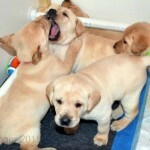 All the puppies are healthy and wiggly and loud! Lots of pictures will be coming soon, and we’ll keep news posted. 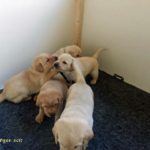 At this point, three females and one male are sold. 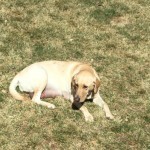 Inara enjoying the hot grass on a wonderful Spring day! 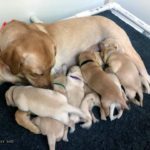 Puppies are due any day starting tomorrow. She’s so heavy and slow now! 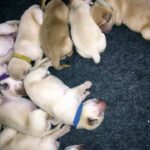 And it’s always great to feel or see the puppies moving around.